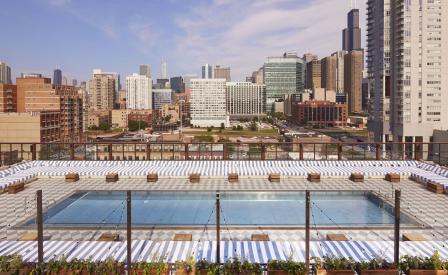 Each property in the rapidly expanding Soho House portfolio seems to outdo itself, and the group’s latest outpost - this time in Chicago - is no exception. Housed in a former belting factory, built in 1907, the group’s in-house design team has seamlessly blended the building’s original features with all the essential amenities needed to create what is their biggest - and best - club yet. Comprising 40 guestrooms, a Cowshed spa, fitness centre, screening room and what is starting to become a signature rooftop pool, bar and kitchen, non-members can take solace in the fact that the lobby lounge and two restaurants - Pizza East and Chicken Shop - have their own streetside entrances and are open to the public.